Went to the Cub Scout Pinewood Derby this morning. 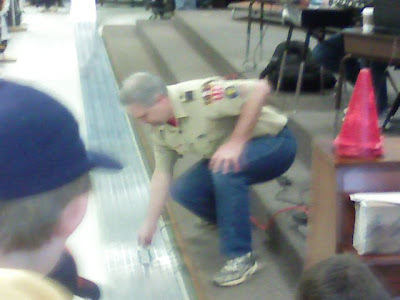 Here’s a picture of the Scoutmaster pushing my son’s car to the finish line. We lost one of the axle nails that came with the kit. Note to self: Simply replacing the proper axle with a brad nail is NOT a good idea. Anyhoo, we still walked away with a trophy for “slickest design.” For the record, my kids have never left any kind of competition without a trophy.